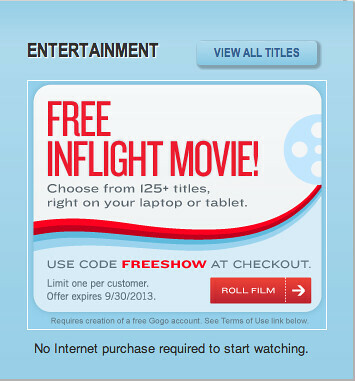 I normally sign in to Gogo and don’t even pay attention to the welcome page, but on a recent flight I actually read the banner graphic and noticed that through the end of the month American and Gogo Inflight Internet are teaming up to offer customers a free streaming movie or television program! • If you stream a movie, you won’t have to watch After Earth! Most movies cost $3.99 and television programs are 99 cents. You don’t have to purchase Wifi to stream a movie. With the promo code is completely free. Fine print: limit one per customer. Offer expires September 30, 2013. @ WJ – Have fun and enjoy the flights and the movies! BTW, how many miles are you going to earn this weekend?